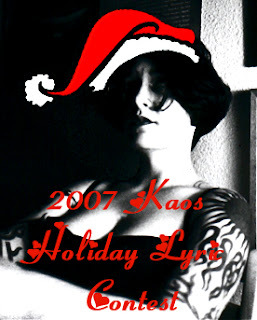 Today we announce the winners of the 2007 Holiday Lyric Contest (about 14 minutes into the show…) Join me, Mr Kaos and very special guest, Daddy Kaos to learn about football, politics, gumbo, and maybe we’ll also talk about the song contest. If you aren’t able to listen in, then come back Christmas eve when I’ll have links to all the winners and participants along with a little bloggy bling for them to call their own. WARNING: not appropriate for little ears! Now I bet you just can’t wait to hear that Santa Punish Me Polka can you? You wish it didn’t take us so long to get things done don’t you? WARNING: my Mad Skillz don’t apply to my “singing”! You can download the podcast and song too! Can I just say thisI love my family dearlyandthat was rather disturbing. I’ll be singing that all day! good job deb on the rocks, and nice speak/ing, Cami! Wow. That was fantastic. Cami, you were perfect. And was that K singing too? Hee hee.And Mr Kaos, I do apologise if you think I was arse licking old chap, but for chrissakes, I just finished Nanowrimo that week. Gimme a break. I do like Debs better than mine though. It was perfect. :DOh and, when you said ‘Wild Turkey’, I thought you meant real ones, but now I assume it’s a drink?? And what is tikki, you never said.And gumbo I will have to google.But I love the podcasts. OMG we need to fly Jo out STAT and introduce her to Wild Turkey, Tiki, and Gumbo. She cannot to through life without having sampled them AT LEAST once. Coincidentally I’ve just done a post praising Mr Shatner’s musical output.Freaky. I think I love Daddy Kaos now. I felt him reaching out to me. this was so awesome. i love the children helping to spread the christmas cheer. they don’t get involved in this type of them enough, don’t you think? so loving daddy kaos. gotta check him out. i bet you don’t hear that enough “hey, i’m checking out your dad.” that’s probably just wrong. OMG! I actually know these people and I also know they are IN the holiday spirit, I also think I knew Cami when she was a tykeblogger………yakyakyakyak! mudbug: hmmmm when I was a tyke you say?holly: yes but I am used to wrong things. Also, those aren’t children. Those are elves… or My dad and I with Mike’s fancy recording filter magic.Sybil: We’ve said many times in the last week that we wish you were here.Mr. Fab: Yeah, everyone kind of loves him…dan: and that was a good post.deb: I am so pleased you liked it.Mie: Since she declined the gift certificate she may be learning something about tiki sooner than she thinksJo: No not K, just a filter on the recording device. Wild Turkey is bourbon, Gumbo is a Cajun dish, it’s like a chicken stew but it isn’t. Tiki. Well Tiki starts here (http://en.wikipedia.org/wiki/Tiki) but now it is something else entirely. Since you declined the gift certificate I will be hand selecting a piece of tiki goods for you and sending it your way. It may take a while though. Ahh Cami that is so sweet. I will go and look at Tiki now.